What does this mean for the currency? Confounding the consensus of a swing back to surplus, the trade balance persisted in deficit for a second consecutive month in August. Not only that, but the $588 million deficit was also wider than the $516 million gap seen in July. The year-to-August balance was still in surplus at $2.4 billion but significantly narrower than the $9.8 billion surplus in the same period last year. Exports rose by 6.7% YoY, better than expected but a slowdown from 8.3% in July, mainly due to the high base-year effect. Automobiles, electronics and electrical equipment, and plastic products have been the main export drivers this year and they remained in play in August. Imports surged by 22.8%, more than double the consensus estimate and the July pace with continued support from fuel products. The base-year effect will become more favourable for imports in coming months, but not so much for exports. In addition, the trade war overhang on exports and firmer crude oil price underpinning imports suggest the trade gap will widen further through the rest of the year. As things stand, 2018 looks to be the first year in four with an annual trade deficit on the order of $1.2 billion, down from a $15 billion surplus in 2017. A falling trade surplus weighs down the current account surplus while slowing tourism has also started to depress the services balance. August tourism data yesterday showed that tourist arrivals growth continued in the low single-digits for the second straight month. This is likely to weaken further with shrinking visitors from China, which were down 11% YoY in August. Absent any offset from services income, the weak trade account will cause the current account surplus to shrink this year. We now estimate the full-year 2018 current surplus equivalent to about 7% of GDP, smaller than our 9% forecast before today’s trade data. 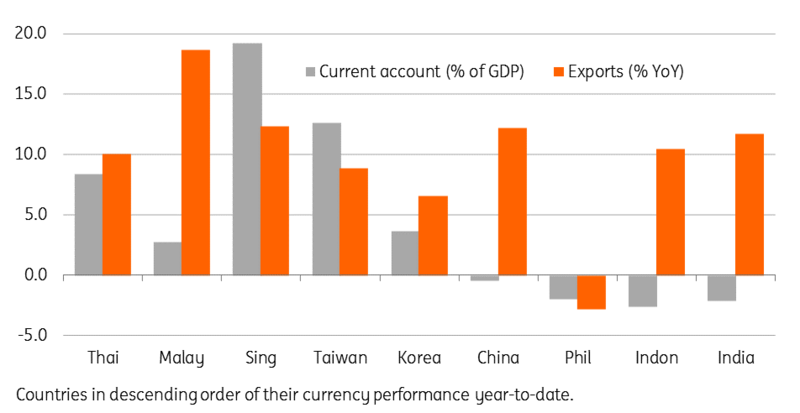 However, this is still strong enough to support continued currency (THB) outperformance during the rest of the year. We maintain our end-2018 USD/THB forecast of 33.0 (spot 32.4).